Nadesico is the first anime I've ever watched from start to finish, and has remained my absolute favorite to this day. Every character is unique, and fleshed out to some degree. The show blends a bunch of genres (sci-fi, drama, romance, comedy, etc) together into one amazing package. It's basically a parody/tribute of many other anime tropes, but has enough heart to stand on its own. And even though there is a harem aspect to the show, it doesn't rely on fan-service for content, instead focusing on character relationships and the story. I also highly recommend the dub for the show. In the dub, each character is acted well, and has a distinct voice, so there's no confusion as to who's talking; an important aspect, as this site has a HUGE cast. Jennifer Earhart steals the show, perfectly portraying the bubbly & ditzy captain Yurika. I'm so excited to watch the dub in HD, I can hardly wait! You can see the new footage in Nozomi's trailer for the Blu-ray. The video quality looks amazing! Really looks great with the HD quality, one can only hope that good sales might help motivate a proper 'successor' to Prince of Darkness like they planned. An absolute favourite of mine, and the first series I ever purchased back in the day. A highly enjoyable but underrated show that never saw its day in the limelight, and unfortunately was cut short without a second season or a completion to the supposed movie trilogy. To any would be buyers, know that this anime excelled in creating an engaging storyline (no-spoilers) with an ensemble of memorable and lovable characters. From the ditsy Captain Yurika Misumaru, to skirt-chasing married man, Seiya Uribatake, everybody will find someone to like in this show. A dub-man myself, the voice acting was top notch, and to those who prefer subbed - sub away my friends, the Japanese VA's were also very good =P. I guarantee that your will have been money well spent - cause for me this will be my third time purchasing this masterpiece. Hurry up and buy this series now! This is THE series to watch above all others. Yes it is not as epic as some other titles, but what sets Nadesico above all is this is the best of life. It parodies all the other genres perfectly and at the same time it is very upbeat, fun, and full of great energy. From the excellent character designs of Keiji Gotoh and the formidable direction of Tatsuo Sato this series explores many great ideas and situations that you would love to find yourself in. All the characters are excellent and highly remember-able. The main story is very future forward and uplifting. The voice acting in the original Japanese is just incredible. The background, and ambient audio is impressive considering how much is always going on all the time. The music and audio is terrific and it will require multiple viewings to really get all that is going on at any given time and fortunately this series has one of the highest multiple re-watch values ever. Great Series.. no noticable jump in picture quality from previous release. I pretty much agree with all the 5 star reviews already. As a series this is in my top 3... hands down. So lets talk about the technical side with these blu-rays.. If your looking to refresh to all Blu-Ray or don't have this series already then this is the way to go. If you already own Nozomi's Collectors edition DVDs you can pass on double dipping.. possibly triple dipping if your like me and already own the ADV release. Really LOVE this show! I bought the old dvd sets and had to buy this on blu ray! I'll keep this short and sweet, if you have the dvds know this, many will say that this isn't much better, it is, and it isn't. Let me explain, the colors are a bit brighter but there is a fair amount of grain in the picture. I put this up against the dvds and where this blu ray set shines is that it isn't blurry, the dvds have a slight blurred picture, the colors can be blotchy and the picture looks washed out at times. For the most part the blu ray looks more vivid and is in sharp focus. Anyone who hates grain will hate this release but for me? It's good enough. LOVE this show and I'm fairly happy that this came out on blu ray. I've seen a few people state that this doesn't look much better than the dvd. Up against the dvds the difference is night and day. the colors are more vivid and the dvd picture is blotchy and blurry. The blu ray picture is sharp, in focus but does have some grain. Let's face it, it's an older anime. It's not a modern digital show. Keep this in mind when thinking about upgrading to this set. I think it is worth EVERY penny and Nozomi did a good job with this release. One of the first anime series I ever watched and a classic, it has humor action and a lot of fun. I recommend this anime for anyone, even if they are like me and dislike the giant robot genera. This blu ray set is almost identical to the older dvd set that also includes the film and OVA, except that the dvd set is slightly blurry, the backgrounds are also blotchy due to compression issues with dvd technology and the blu ray edition isn't. The picture quality is crystal clear, not out of focus and the backgrounds aren't blotchy. Another thing blu ray is really good with is color saturation, colors look good here. Maybe not as vivid as the new Gundam blu ray sets but it's better than the dvds. On the negative side, The show has always been a bit grainy, however, this isn't something that is a fault with ADV, Rightstuff/Nozomi etc but with the source material. This is the cleanest it will look to be honest and Nozomi did a GREAT transfer for this current blu ray release. As for sound, the dvd/blu ray is almost identical to be honest. I run it through a 5.1 surround system (for both the dvd and blu ray editions) and didn't really notice too much difference there. Martian Successor Nadesico is a great series to watch. It had action and romance. The plot is great as well. I saw this wonderful release come out and I had to buy it. Not only did this blu-ray set have the series, but it also has the movie and the OVA (Which wasn't released on the original dvd's). This was all compact within the confines of a single case. Great job with the release and bringing back great memories. I was hugely dissapointed with this series that was said to be a classic . The series usually has the "comedy" tag but do not be fooled. The predictable jokes and quirks are few and far between. The protagonist is a whiny little boy. The fact he drives a pink mecha says a lot about him. The only enjoyable characters are Ruri and a few of the minor characters solely there for "comedy relief". The series gets a 3 out of 5. The movie is slightly better and I will not spoil anything here. The OVA is beyond terrible. It is a rehash of the anime-inside-the-anime clips. It gets a 0 from me. My rating is taking into consideration the inflated price. 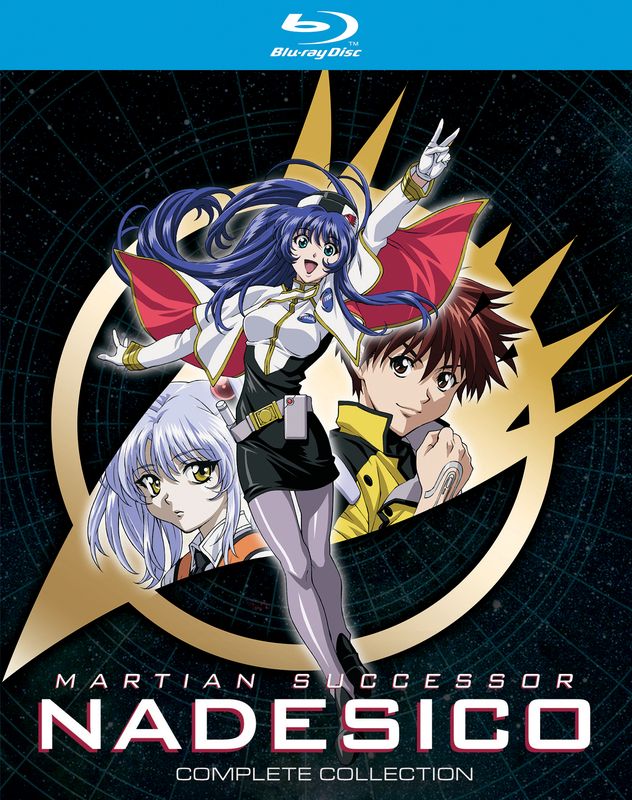 If You own the Martian Successor Nadesico DVD box set from the ADV release many years ago you do not get anything better here from the RightStuf Blu-Ray release. Nadesico was produced by Studio Xebec as a fun parody like Vandread only with much more humor. The giant mecha series, hero's out to save the earth under alien attack, lovable oddball characters and many plot twists. It is one of my all time favorite anime. My problem with this Nadesico Blu-ray release is that it seems no different than the original ADV / Complete Chronicles, I bought back in 2003. The video quality is the same as the older release, no compression. The aspect ratio is 4:3 only. And it looks very grainy and pale color palate. Audio 2.0 (stereo) only, no 5.1 surround system upgrade. This Nadesico Blu-Ray box set is legacy media and should be viewed as such. This is a fun series and I think most mecha fans will get into a light hearted romp that this pre-2000 show was.